La Conquestadora has had many titles through the centuries. 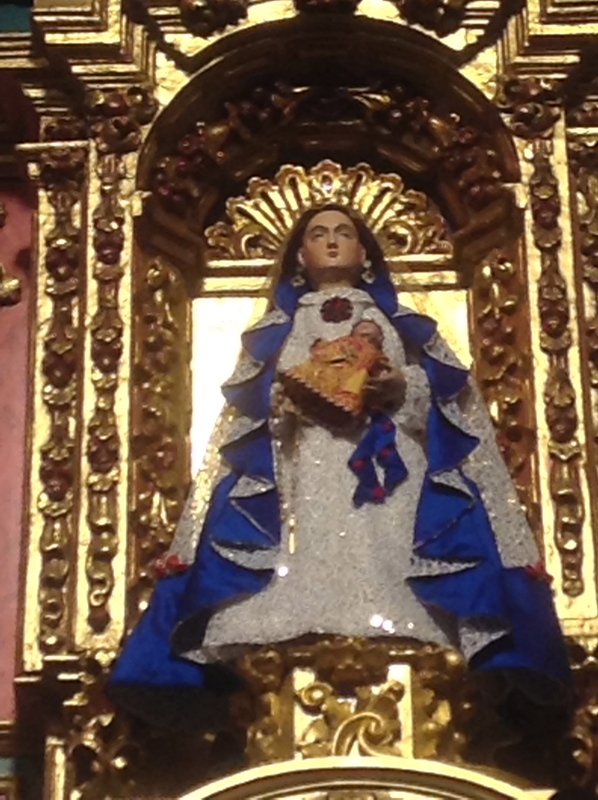 She was known as Our Lady of Assumption, Our Lady of Conception, Our Lady of the Rosary and Nutetra Senora de la Paz. She first was brought to Santa Fe by the Franciscans. But on August 12 in the year of 1680 an Indian up rising occurred killing 21 priest and the burning of the city of Santa Fe. The church was also set on fire but, La Conquestadora was rescued from the flames. The threads of this Virgin’s story being rescued from the fire….rings a bell in me. Is this not the myth of the Black Virgin that walks through the fire or is scorched by the desert sun? La Conquestadora’s history at this point is questionable because the church’s records were destroy between 1697-1777. Also there has been embellishment of the La Conquestadora’s story that is mixed with deep devotion and historical facts. But there is a possibility here that she was originally a Black Virgin and I like to explore the reasons why. This was a time in Spain’s history that a bridge was trying being created between the Muslim invaders and the Christians. The icons of the Virgin Mary were being used to bridge this gap between two very different religions. Even to this day you can find that Spain has an ancient tradition of Black Madonnas such as the Black Virgin of Montserrat and Lady Guadalupe of Caceres Province. Also Virgen de la Pena who has her home near an old Moorish castle. Angelico Chaves a Fransiscan friar 1910-1996 wrote both the historical and devotional roots of La Conquestadora. He speaks of the original wooden robes were crudely carved away from the icon which he called butchery. The second wood-carver altered her shape, remove the wooden veil from her head and made a hole in her head to attach a wig. Then movable arms were added. La Conquestador after her alterations was dressed in ornate Spanish clothing of the time period. And given a crescent moon for her pedestal. We do not know the timing in history when these alterations took place. And maybe it was during this transformation her dark Moorish face was also white washed It was common place in the church to paint over Black Madonnas of Europe because it was an embarrassment and lack of an explanation for their color. 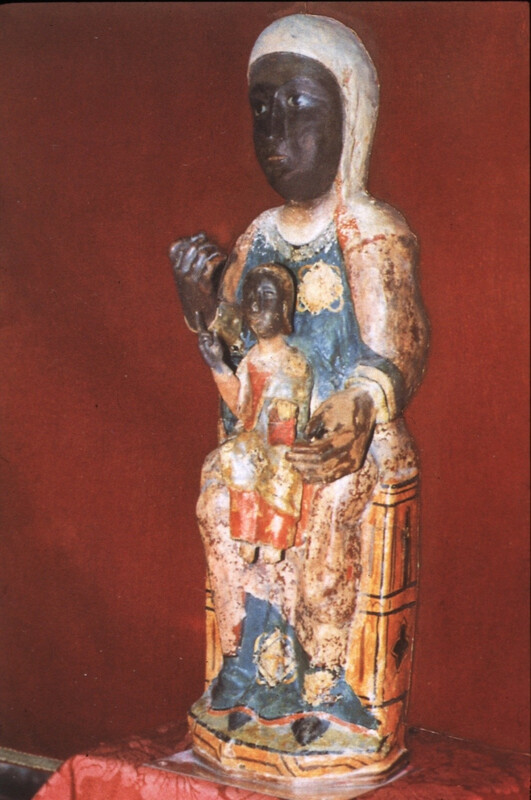 Black Madonnas origins are much older than Christianity. Black Virgins draw their power from pagan roots and the rich fertility of the Earth. Our Lady of Einsiedeln in Austria was painted over.. She went into hiding in 1798, when the threat of Napoleon’s army came into play. When Our Lady of Einsiedeln was returned in the year of 1803 she had been cleaned and whiten. She then was restored to her original blackness and returned to her place of honor. History tells us La Conquestadora returned to Santa Fé 12 years later after the Indian revolt. She was brought by Don Digo Vargas and his army that reclaimed Santa Fé territory after praying to the Virgin. This was the time the Virgin icon was given the name La Conquestadora “The Mother who Conquers. What happens when we use a religious icon for political, religious or physiological manipulation is the real question here ? This has been done down through our history. An Icon or arc-type can be a powerful window into ” Divine Experience”. An icon of the Divine Mother in truth is “The Divine Essence in Form” It is up to our own view to erase the separation we experience being in form. When we look at the genocide and butchery of the Native American people….this was also reflected in the radical transformation that happen to original form of La Conquestadora under a butcher’s knife and the white washing of the Mother’s image. When we can begin to view another culture or religion as a mirror of our self….then we can begin to conquer the views of separation on the planet. In recent history a controversy arose with the Native American people of Santa Fé. They protested against the violence that such a name carried. To soften the blow the church adopted the title ” Our Lady of Conquering Love”. She was also given another title Our Lady of Peace. This Madonna straddles between two worlds….which might be the symbol of her olive/willow wood body. Olive trees are the symbol for peace, while willow carries the symbol of suffering and sorrow. It is only through peace we can begin to heal the gap of different cultures and ease the suffering of our historical difference. Santa Fe has become a blend of Native American, Mexican, and Spanish, blood lines which creates a rich and colorful culture of art, music and talent. La Conquestador “Our Lady of Conquering Love” can be found in St. Francis Basilica in Santa Fe New Mexico. She is here to remind us that it is through peace, respect, tolerance and admiration for our cultural difference healing can be restored.